Lüning reminds listeners that the question concerning how much of the recent warming can be attributed to man is still being hotly debated, and that we know that natural factors have always been in the driver’s seat in the past. Personally Lüning believes that the real figure is closer to 50-50, with a likelihood that natural factors are a bit more than half. 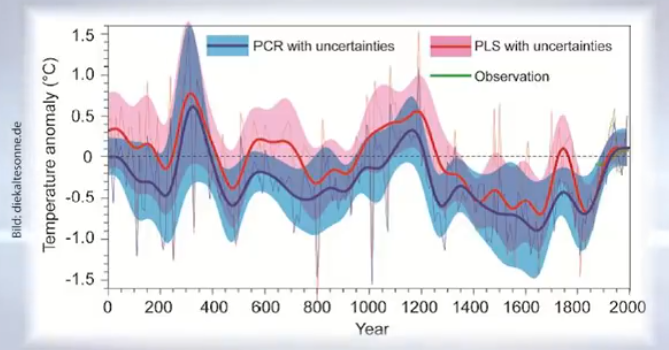 He thinks the CO2-based climate models so far have been unable to explain the climate variability of the past, but that those based on natural factors and the past changes are far better. Concerning another 1°C of warming ahead, he says that it would not be only bad news. “There would be winners and there would be losers.” He points out that especially Canada and Siberia would profit. Lüning calls the media “filtering” a fundamental problem that should not be happening in the 21st century. In Lüning’s view, the path is very long and it should be taken one step at a time. He also tells JF-TV that climate science is still poorly understood and that more research needs to be done. He sees no need to hysterically put the entire economic system in question. On a positive note, since the JF-TV interview was released on Youtube just 2 days ago, it has been viewed already almost 50,000 times. For a German climate skeptic video, this is nothing short of phenomenal! Perhaps in Germany it’s one thing to protest climate change, but maybe people are now getting fed up with kids not going to school and instead irrationally turning the discussion into a hysteria. Germans are also starting to get fed up with the onslaught on their industry and jobs. Lüning is being far too kind. Perhaps by stating an opinion that the man-made component [of warming since 1950] is roughly 50%, he isn’t rejected outright as a “climate denier” and thus is viewed by more people who are sitting on the fence. Perhaps this is tactically shrewd. 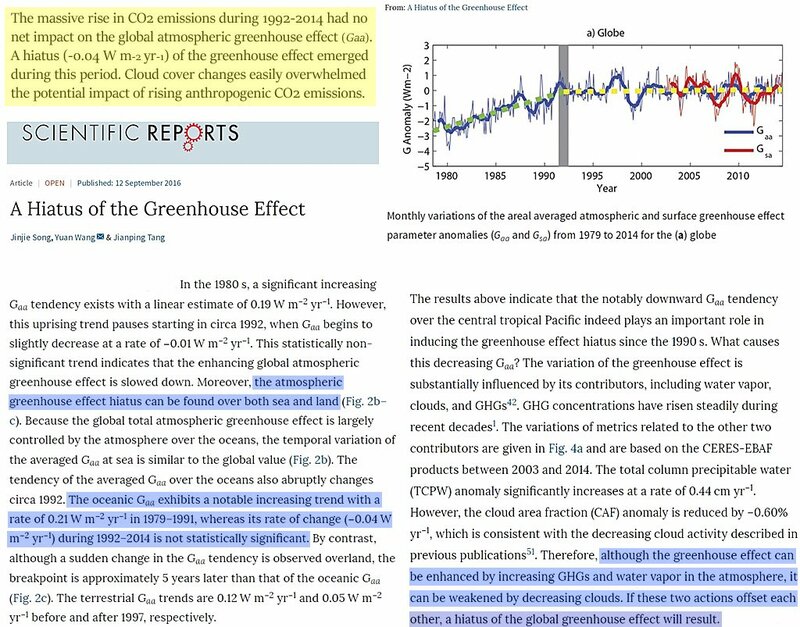 But the onus should be on those with the theory (that human GHG emissions are now driving the ‘global climate’) to demonstrate that the ‘null hypothesis’ is invalid, which in this case would be that ‘natural factors’ weren’t in fact responsible for the recent warming. This would be very difficult to prove, of course (if not impossible). But the IPCC’s repeated proclamations that this is the case does not make it so! You can’t prove a negative, Kurt. If you think the warming comes from natural factors and has nothing to do with GHGs increasing, show us how that would work! The skeptics arguments on this topic are well known and have not been able to demonstrate to us normal people how AGW could be hoax like you guys claim it is. What is the bill hypothesis of that claim? If you think the warming comes from natural factors and has nothing to do with GHGs increasing, show us how that would work! You can’t prove a negative, Kurt. Then prove whatever it is you can, SebastianH. Warming was 100% natural prior to human intervention. Now you believe it’s 100% caused by humans. Prove it. I just read something that me me think. How can a large group of people have 97% agreement on anything?. They would have to be VERY like-minded to begin with. Anyways, a curious question. The reality is that, based on the paleoclimate record and the work done with models. one can conclude that the climate change we are experiencing today is caused by the sun and the oceans over which mankind has no control Despite the hype, there is no real evidence that CO2 has any effect on climate and there is plenty of scientific rational to support the idea that the climate sensitivity of CO2 is zero. Climate change is so slow that it takes networks of sophisticated sensors, decades to even detect it. We must be careful not to mix up weather cycles with true climate change. The AGW conjecture is based on only partial science and is full of holes. For example, AGW depends upon the existaince of a radiant greenhouse effect provided for my trace gases in the Earth’s atmosphere with LWIR absorption bands. Such a radiant greenhouse effect has not been observed in a real greenhouse, in the Earth’s atmosphere or anywhere else in the solar system. 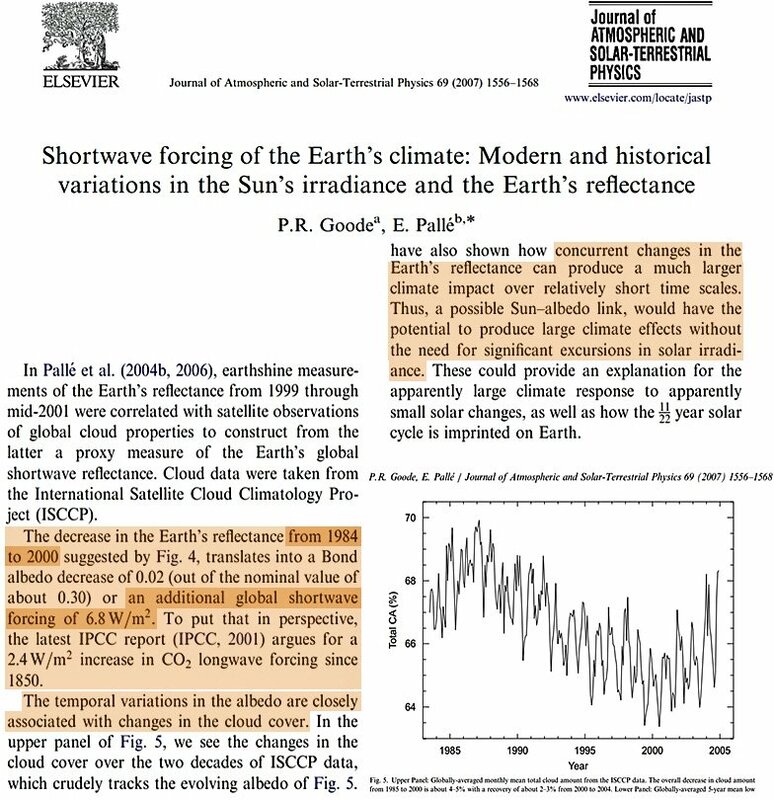 The radiant greenhouse effect is science fiction so hence the AGW conjecture is science fiction as well. There may be good reasons to be conserving on the use of fossil fuels but climate change is not one of them. William, nothing you wrote in your first paragraph is even remotely true. I wonder what let you to believe it would be, I really do. And that truism can not be said often enough. Only the ignorant, and the ignorant but mendacious alarmists, would say it’s not the sun that has the major influence on our climate. The atmosphere and the oceans redistribute this solar energy. This much is very settled science. Any effects from CO2 are lost in the noise of current NATURAL climate variations. Regarding global warming, or whatever, there is not now, nor was there ever 97% agreement. This is a totally bogus number. In other words, the “large group of people” declared the issue and went from there. It really has nothing to do with global warming or climate, but does hope to promote One World Government. Don’t miss Agenda 2030 on that site. It would be great if a version of this interview with English subtitles could be made. If Germans in Germany were serious about the carbon conundrum, they would all stop drinking beer immediately. It will be a cold day in hell when that happens. A beer fast in Germany will be like a cod fast in Iceland. Close every brewery in Germany, just too much carbon dioxide dissolved in solution, wind farms have to be in Germany all because those crazed beer drinking Germans need them to reduce carbon emissions that the breweries are causing. Germans need to outlaw barley, hops, yeast, water, even air and fertile soil. Beer needs air and fertile soil to become bier. Das ist Verboten. Reduce the number of wind turbines to zero, increase the number of breweries by ten fold. You’ll be happy as a clam, just a better world. Sasquatch, I wish they taught the simple accounting method known as ‘mass balance’ in processes to a wider range of students. It is understandable to the layman outside of science and engineering (actually, surprisingly even many climate scientists appear to be unaware of it). It would reduce the verbiage in debate by perhaps 50%. For example, to make beer, you have to grow barley and hops,which take carbon dioxide out of the atmosphere. When you brew the beer, it simply re-emits the CO2. Meanwhile, the following crops re-take the CO2 emitted in brewing and grow anew. Beermaking is wonderfully ‘sustainable’. We can drink it without guilt! Climate boffins who want us to stop eating beef because of their gaseous emissions are exactly analogous. While the cow is chewing up the grass, the clipped grass left, immediately begins to take up more CO2 and grow again. Cows are vegans that operate in a grand sustainable way.